London promoter Mark Lyons has joined forces with Championship campaigning Marianne Marston to co-promote a huge pre-Christmas event, aptly named LET BATTLE COMMENCE, at the York Hall in Bethnal Green, London, on Sunday 6th December. Bradford’s Tasif Khan makes his first foray onto the World stage, when he challenges Ghana’s Isaac Quaye for the World Boxing Union Super Flyweight Championship. 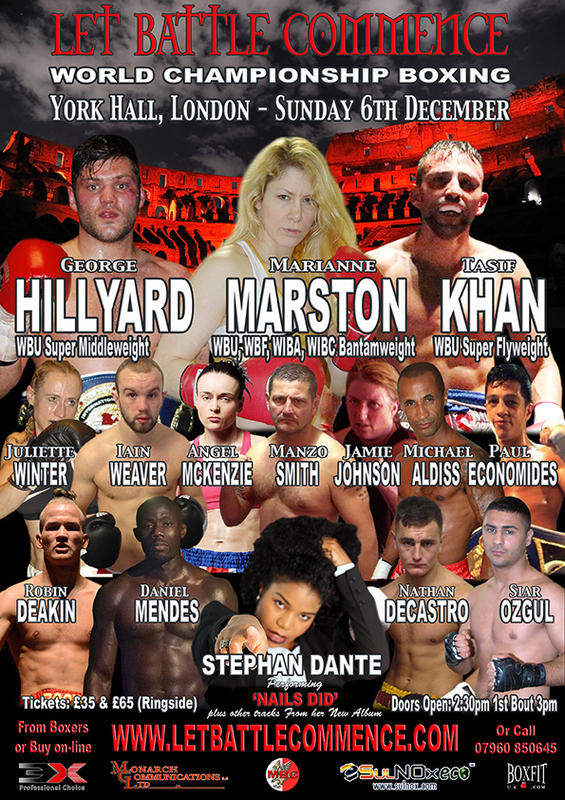 Reigning World Boxing Union Super Middleweight International Champion, Nazeing, Essex’s George ‘Hithard’ Hillyard aims to add the vacant WBU World crown to his collection, when he faces a yet to be named opponent. Finally British #1 and reigning MBC International Super Bantamweight Champion Marianne Marston will go toe to toe with Hungary’s Csilla Nemedi in a four, WBU, WBF, WIBA & WIBC, Bantamweight World title unification bout. Also on the Championship trail on this historic event will be a number of fast rising young stars. Former Team GB star Iain ‘The Blessed One’ Weaver gets his first taste of professional Championship boxing, when he challenges a yet to be named opponent for the International Masters Super Featherweight title. Bardney, Lincolnshire’s unbeaten prospect, Nathan ‘Nightmare’ Decastro also will be fighting for an International Masters Championship, albeit at Middleweight. 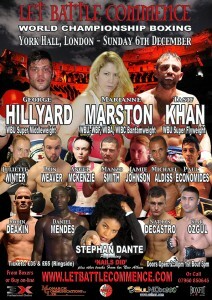 The final Championship bout will see reigning MBC International Welterweight Champion, Hackney’s Siar Ozgul, challenge for another International Crown, this time at Super Welterweight. Supporting the six Championship bouts are nine bouts featuring the cream of local talent, including another reigning Champion, WBF Super Bantamweight Intercontinental supremo Paul Economides in a non-championship six rounder. Joining Paul on the undercard is another well known Champ, former British and Commonwealth King, Michael Aldiss, who made his most welcome return to the ring back in October. Another hugely popular recent returnee to the hallowed square ring, Super Middleweight Manzo Smith will also be in action, as will Rockin’ Robin Deakin, who will be seeking to add another win to his card, following his victory over Deniss Kornilovs back in August. Unbeaten, big punching Cruiserweight prospect Daniel Mendez will be looking to add a third scalp to his belt on the night, as Adam Taylor seeks to get his career back on track when he faces off against a yet to be named opponent. Back in August Marianne Marston, Shaunagh Brown and Sam Smith made history when they all fought on the same event at York Hall, as that was the first time that three female bouts took place on a pro event in the UK, well on the 6th December that record will get broken, as joining Marianne on the card will be former Big Brother star and multi title challenger Angel ‘The Entertainer’ McKenzie, British Masters Super Flyweight Champion and World Championship challenger Juliette Winter and making her most welcome return to the sport Jamie Johnson. In addition to the top class boxing fayre, the event will also feature the first live performance by local singing star Stephan Dante, who will be performing her viral smash ‘Nails Did’, as well as further tracks from her soon to be released debut album. To cram all this action in the doors will open at 2:30pm, with the first bout starting at 3pm. Tasif Khan vs Isaac Quaye, Marianne Marston vs Csilla Nemedi and George Hillyard vs TBA World Title bouts co-headline the Monarch Communications, BoxFit UK, 3X Sports and Sulnox Eco Systems PLC sponsored Mark Lyons and Marianne Marston co-promoted LET BATTLE COMMENCE event at York Hall, Bethnal Green, London on Sunday 6th December 2015. « BREAKING NEWS: Myekeni Withdraws From World Unification Battle With Marston Due to Injury. BREAKING NEWS: Myekeni Withdraws From World Unification Battle With Marston Due to Injury.